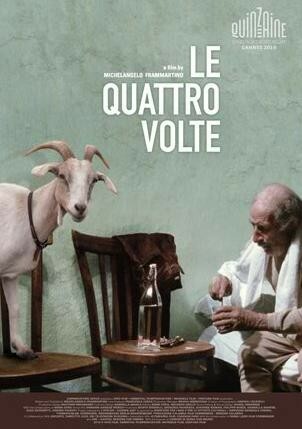 Italian director Michelangelo Frammartino succeeds in crafting a subtle masterpiece in LE QUATTRO VOLTE, a film that patiently explores existence in a remote Calabrian village, unembellished by conventions of plot, musical score, or even spoken language. Instead the camera slowly roams in long shots, both spatially and temporally, giving a detached perspective that transcends anthropogenic conceits. It is like Emerson’s “transparent eyeball” gazing impartially, free of ego, leading us to make associations that a human observer embroiled in culture and routine might normally fail to consider. The viewer first observes the quiet life of an old goatherd stricken with respiratory illness who seeks remedy in the dust collected from a church floor, which he then stirs into his glass of water at bedtime. Next, we follow the life of an actual goat, from its unceremonious birth to the end of its life, before eventually becoming invested in the stoic presence of a large conifer with its own curious fate. Devoid of civilized hubris, we watch the old man crouch in the tall grass with an ant crawling across his face, much the same way we gaze upon the livestock he tends, as well as the tree that later has an ant traversing its own surfaces. The manner in which LE QUATTRO VOLTE regards human biomass and goatly affairs on par with other forms of matter and movement evokes not only Transcendentalist philosophy, but also relates closely to the concept of emptiness in Mahayana Buddhism. However, to appreciate this film, the viewer does not need to engage it with an analytical fervor. On the contrary, the beauty contained within each frame captivates without pushing the audience toward any specific or predetermined conclusion. It invites individual rumination as it gently unfolds with a meditative innocence, using a natural vocabulary that bypasses the usual conscious filters, achieving a visceral kind of meaning difficult to pin down in discreet terms. If the thought of enduring an overly cerebral and confounding arthouse film seems off-putting, rest assured that LE QATTRO VOLTE is both accessible and engrossing, not requiring the diligence of a scholar nor the patience of a monk. 4 out of 4 stars.